"EuroMillions Results that have Produced BIG EuroMillions Winners"
In this section we take a look at some Euro Millions Winner facts, figures and stories that have lit up the world of lotteries over the years. We will be looking at the stories of some of the biggest and most lucrative Euro Millions Prizes since the Euro Lotto began back in February 2004. Some of these jackpots really are the biggest to be won in the history of any European lottery games – and dwarf most of the prizes available in most other lotteries around the world. These EuroMillions winner stories are inspiring to say the least and just goes to show what can happen when the EuroMillions results go in your favour and you are playing one of the world’s richest lottery games – the EuroMillions. The biggest lottery wins in the history of UK Lottery games go to the following 2 massive Euro Millions Jackpot wins that occured in 2011 and 2012 – the EuroMillions results on both occasions producing truly mind-boggling jackpots. Firstly there was the massive Euro Millions jackpot win of €185,000,000 (£161,653,000) that was claimed by one lucky couple from Largs in Ayrshire, Scotland – Colin and Chris Weir – on Tuesday July 12th 2011. The Weir's struck lucky with their monumental Euro jackpot win when they correctly picked the winning Euro Millions Numbers which were 17, 19, 38, 42, 45 and the Lucky Stars 09 and 10. 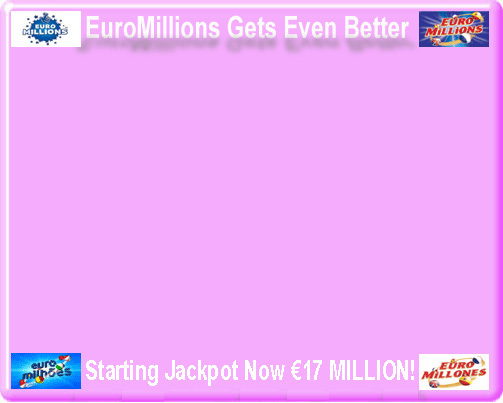 Next came the €190,000,000 (£148,656,000) Euro Millions jackpot win on August 10th 2012 again going to UK EuroMillions players – Adrian and Gillian Bayford from Haverhill in Suffolk – who found fortune with the numbers 11, 17, 21, 48, 50 and the Lucky Stars, coincidentally, 09 and 10. So, as you can see, the EuroMillions jackpot DOES reach the lofty heights of €190 MILLION – the Bayford's win in 2012 being the biggest ever win in Euros whilst the Weir's 2011 win is the biggest ever so far in Pounds Sterling due to the differences in the exchange rate at the time. The EuroMillions jackpot limit of €190 MILLION was also reached a couple of years later when an anonymous tickt holder from Castelo Branco in Portugal won the record equalling jackpot on October 24th 2014. The equivalent in sterling on this historic occasion was £149,758,000. The first EuroMillions winner story that we will talk about in detail is the reasonably recent Euro Millions jackpot win that took place on Friday 7th November 2009. There were 2 EuroMillions tickets that week which matched the correct Euro Millions numbers and they were both purchased in the U.K. The EuroMillions draw that took place that week created a whopping Euro Millions jackpot of €102 Million (£91 Million) after rolling over for a number of weeks producing the biggest lottery win in British lottery history and paying out the largest ever lottery prizes in the U.K. So, £91 Million was shared between the holders of 2 EuroMillions tickets in the U.K. – a 7 strong EuroMillions syndicate from Merseyside and a husband and wife from Newport in Wales. Each lucky Euro Millions winner scooped an amazing £45,570,835.50 – the Euro Millions syndicate members each receiving over £6.5 Million each. The winners in Wales were Mr. Les Scadding & his wife Samantha who live in Caerleon and they have well overtaken the previous UK lotto record for the biggest individual lottery win held by Angela Kelly who won £35.4 Million in 2007. Angela Kelly was more than happy to congratulate the new EuroMillions record holders – saying – "I want to congratulate the lucky winners on taking my National Lottery title. My win has enabled me to bring a great deal of happiness to my friends and family, which has in turn made me very happy. I wish the new winner the best of luck." The 7 Euro Millions syndicate members were Emma Cartwright, 23, Donna Rhodes, 39, Sean Connor 32, James Bennett 28, Ceri Scullion 35, the youngest member Alex Parry 19 and the syndicate leader John Walsh 57. They are all work (or maybe DID work!) for Hewlett Packard carrying out IT work for British Telecom and actually thought they were just about to be made redundant when they received the call telling them that they had won the EuroMillions jackpot! The EuroMillions results produced the following combination of winning Euro Millions numbers for them which were drawn as follows: 11, 19, 34, 43, 45 and the 2 Lucky Stars were 5 and 9. Euro Millions Winner – How Does it Feel? It is interesting to note that only around 25% of Euro Millions lottery jackpot winners – indeed all lotto jackpot winners – tend to opt for publicity when the EuroMillions results go in their favour. So we are very fortunate to be able to read and hear the thoughts of those lucky enough to be blessed with winning such a prize as a truly enormous Euro Millions rollover jackpot. We wish them all the very best for their futures. It is also interesting to note that when the EuroMillions results produce such a huge EuroMillions lottery prize which is won and shared by more than one ticket – it is actually highly unusual for these separate winning EuroMillions tickets to come from the very same country – in this case the U.K. The largest ever Euro Millions jackpot to have been won by the holder of a single EuroMillions lottery ticket at the time – was the incredible amount of €126 million (£110 million) which was won by a woman from Spain when the EuroMillions results were announced back in May 2009. No further information is available on this lucky Spanish EuroMillions winner as she opted for the ‘privacy’ option when she realised that she had correctly correctly predicted the EuroMillions results that week. On this occasion the Euro Millions experienced a Rollover that occurred 6 times before being won – the EuroMillions results here were 4, 23, 24, 29, 31 & the 2 Lucky Stars were 8 and 9. From back in July 2005 until the big EuroMillions win in Spain in May 2009 – Dolores McNamara, 45, held the record for being the biggest single ticket Euro Millions winner – when she claimed an astonishing €115 million (£77 million). This time the EuroMillions results produced a 9 times Rollover before the winning lottery numbers were selected proving Dolores McNamara to be the lucky winner of a record Euro Millions jackpot on July 29th 2005. Dolores – a housewife and Mother of 6 from Ireland – bought her ticket in Garryowen, Limerick, Eire and used the Lucky Dip – Quick Pick – option. This means that Dolores hadn’t even selected her own personal Euro Millions numbers which instantly made her the 72nd richest person in Ireland as soon as the EuroMillions results were announced. Her actual win amounted to €115,436,126 which she claimed from the Irish Lottery headquarters in Dublin having been working as a part-time cleaning lady at the Limerick Youth Centre. For 9 months after becoming a record Euro Millions winner Dolores continued to live in her average bungalow in Limerick with her husband and children before moving to a €1.7 million hall in County Clare. The EuroMillions results that made Dolores a record EuroMillions winner were made up of the numbers 3, 19, 26, 49, 50 and the two Lucky Star numbers 4 and 5. The highest a Euro Millions jackpot had ever reached by early 2006 was a mind-boggling €183 Million (£134 Million) after the latest EuroMillions results produced an 11 times rollover in February 2006 and was shared by 3 Euro Millions winners who had correctly matched the jackpot numbers. Of these 3, there were 2 winning EuroMillions Tickets from France & 1 Euro millions winner from Portugal – they each received €60 Million. This record €183 million EuroMillions jackpot was matched yet again later the same year in November 2006 only this time there was no-one who had correctly correctly predicted the EuroMillions results and selected all of the winning Euro Millions numbers. As the game had already rolled over 11 times and this was the 12th EuroMillions draw in the sequence – it was time for the Euro Lotto jackpot to “roll down”. This meant that the huge jackpot was paid out to all holders of EuroMillions tickets that were winners on the next level down in the EuroMillions results – matching 5 numbers and 1 Lucky Star. This amounted to 20 separate EuroMillions tickets with each Euro Millions winner getting 5% of the €183 Million prize pot – a total of €9.6 Million each. Of these 20 winning EuroMillions Tickets – 7 were from the U.K., 4 from France, 3 from Spain, 3 from Portugal, 2 from Ireland and 1 from Belgium. We look forward very much to adding to this Euro Millions Winner – EuroMillions results – section as time goes by – it will surely only be a matter of time before the existing Euro Millions winner records are overtaken and the EuroMillions results create brand new record holders. It would be great to be able to include your name and story as a lucky EuroMillions winner of a truly enormous Euro Jackpot prize.